We love Japanese food, but it can be pricey. That’s why we like to get our fix mid-day, taking advantage of the specials and de-stressing in the calm atmosphere at Beverly’s Kame. We’ve visited Kame several times over the past few years and find the food consistently fresh and well prepared. The menu contains no surprises but has a great selection of traditional Japanese/American fare like dumplings, sushi, tempura, noodles, and teriyaki. We like the fact that sushi is available with either white or brown rice, although the price for the latter is slightly higher. We sampled the spicy tuna, salmon/avocado, shrimp tempura, and eel/avocado maki ($5–$7.50), as well as salmon sushi ($4.75 for two pieces). 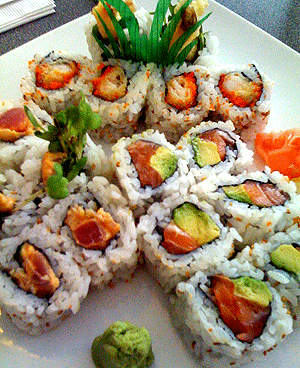 The fish was tender, the avocado was ripe, and the rolls had the right amount of wasabi. We also tried the steamed shumai appetizer, which was perfectly cooked and came with spicy mustard sauce ($6.50). The best deals on the menu are the lunch specials, which run from $7.50 to $8.95 (sushi plates are a few dollars more), and the bento boxes. 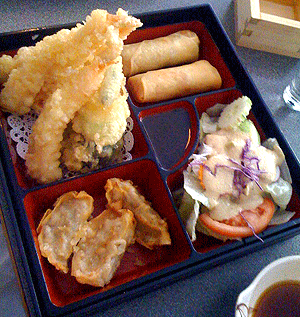 We tried the tempura bento box and got more food that we could eat for $10.95. There was a large portion of tempura, salad, two egg rolls, three dumplings, and a bowl of rice, plus a miso soup starter. The salad had a bit too much dressing, but everything else was spot on, and the tempura was perfectly fried. Several varieties of sakes are available, including one unfiltered, ranging in price from $5.50 to $7. We tried the Kaishu Honjyozo, which was $5.75 and came as a shot standing in wooden box containing more sake. Perhaps one of our sake-expert readers can tell us the origins of this presentation. If you prefer to indulge after the meal, try the tempura dessert ($5.50), which we’ve enjoyed on previous visits: a large plate of delicious tempura-battered bananas topped with chocolate sauce. I drove to KAME for lunch as you suggested, but unfortunately they are closed for lunch. I checked the hours and they are not open any day for lunch. Wish I had known, but thought you would like to know to edit your post. I do like your blog though, lots of good information. Hi Mary! I feel terrible about this–you drove there on our recommendation and were closed out. Sigh. I’m guessing you went on a weekend day because I just checked the hours on the Web site, and they are not open for lunch on Saturday or Sunday. They are open for lunch during the week–I can assure you! We were there! Maybe we can talk them into opening for lunch on the weekends? Went to Organic Garden instead. While it wasn’t our first choice, it was very good. Thank you for this blog and all of the wonderful tidbits here. We are headed out to Danversport Yacht Club for lunch this Saturday afternoon, hopefully we’ll get a seat on the patio. Well, at least you had a nice lunch at Organic Garden. I have never eaten there. What did you have that was good? And thanks for the kind words about the blog. We have a wonderful time doing it! The menu is available online, but to me it was very confusing. Luckily, my friend and I shared plates so we doubled our fun. We started out with guacamole and chips (ha~ their version of chips is dehydrated vegetables), and sliced carrots rounds. Very tasty. Next we shared a salad of baby mesculan and spring greens with a tomato, avacado salsa and sea vegetables. I wasn’t sure about the sea veggies, but it was excellent. Next, we shared a Margarita pizza. It had a dehydrated veggie crust (takes 6 hours to dehydrate), fresh tomato and basil on top. And the switch out of cheese was the only thing I wasn’t too crazy about, but didn’t hate it. All in all, it’s a great little place!